CAPE CANAVERAL, Florida (AP) ― NASA is pressing ahead with Monday’s planned launch of a supply ship despite a critical computer outage at the International Space Station, promising the situation is safe. “We’re good to go,” said NASA space station program manager Mike Suffredini. “There’s a certain amount of urgency to go ahead and get these vehicles” at the space station, he told reporters. These shipments have to fit around other space station operations, like crew comings and goings. A spacewalk will be required, meanwhile, to replace the bad computer. Engineers don’t know why it failed. Suffredini said the spacewalk will be conducted by a pair of astronauts on April 22, using suits outfitted with new fan components to avoid the near-disaster that occurred last summer. An Italian astronaut almost drowned when his helmet flooded with water from the suit’s cooling system. An April 22 spacewalk will give SpaceX two chances to get its unmanned Dragon capsule flying. Good weather is forecast for Monday’s 4:58 p.m. launch. If that doesn’t work, the next launch attempt for the California company’s Falcon rocket would come Friday. For the past few years, NASA has been paying SpaceX ― Space Exploration Technologies Corp. ― and Virginia-based Orbital Sciences Corp. to keep the station well stocked. The need arose after the space shuttles ― NASA’s workhorses for station shipments ― were retired in 2011. Russia, Europe and Japan also make occasional deliveries. 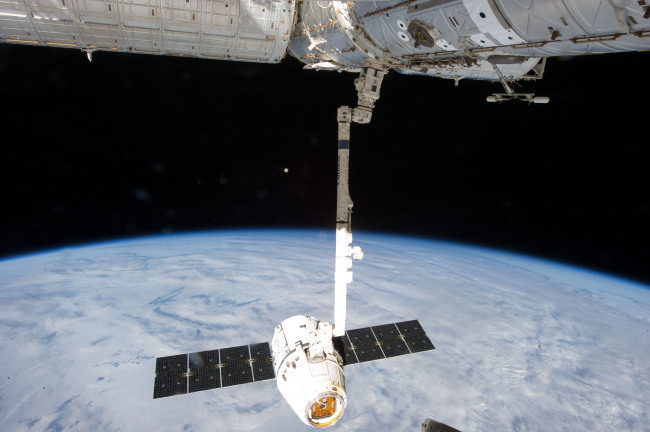 As soon as the Dragon soars, the space station’s solar panels will be moved into the proper position for its arrival, Suffredini said. That will guard against any complications resulting from additional computer breakdowns. Luckily, the sun’s angle is favorable right now for thermal conditions at the outpost, he noted.